Dope is a collaboration between two of the most versatile, renowned musicians in Australia. Here is a rare opportunity to be up close with virtuosos who spend most of their time on the concert platform. Peter Toohey is a concert solo guitarist and recording artist who has performed throughout Europe, Australasia and North America. See Peter's own webpage on this site. Doug Gallacher is a drummer/percussionist with legendary status in the industry. In the studio and in concert he has performed with everyone from Chuck Berry, the Supremes, BB King and Peter Allen through to the Wiggles and Kasey Chambers. 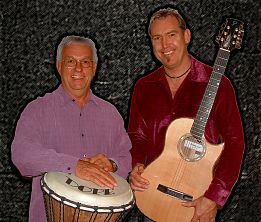 Together their artistry explores all musical genres with sensitivity, verve and even humour. Classical, Jazz, Pop, Latin, Blues and Country are presented in an acoustic texture, which is transparent enough for you to carry on a conversation a metre away. Indulge yourself and your friends in a rare musical experience.